Ultimate SD Cartidge For ColecoVision & ADAM Computer System © 2010 Atarimax. 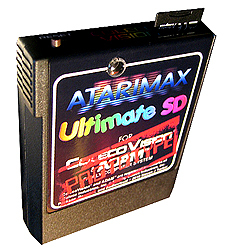 Atarimax Ultimate SD cartridge For ColecoVision & Adam Family Computer System. 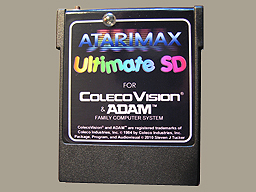 Steven Tucker at AtariMax has developed the Ultimate SD cartridge for the ColecoVision/ADAM. The Atarimax Ultimate SD Prototype Cartridge. Steven J Tucker at Atarimax is the developer. Here is a brief description of the cartridge features. 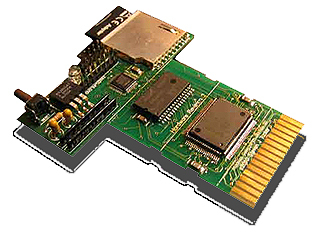 50 MIPS CPU with high speed SD Interface, internal RAM and flash memory for cartridge settings. FAT32, FAT16, SD (up to 4GB.) and SDHC (up to 64Gb.) Support, no practical limits on number of games stored on each card. 128KBytes of Non-Volatile Block Flash for Diagnostic/Boot ROM/Additional Storage/etc. Cartridge boot time, from power on to FAT32 display is less than two seconds, with plain english diagnostic messages in case of boot failures. Cartridge load time for a 32K ROM image is around one second. Full Read/Write access to all 512KB+ of memory for games using the new Hybrid bank switching mode. 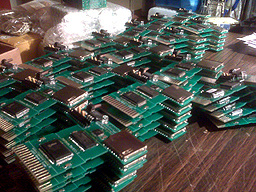 CPU firmware, cartridge boot rom, cartridge hardware logic and menu software are all fully upgradable from the SD card. The Cartridge is able to automatically read and display files present on your FAT32 formatted SD card. Menus are created 'on the fly' from the directory structure with optional full or limited long filename sorting. No special menu creation or other PC loading software required. This means no dependence on Windows drivers or software. You can create and load your card from any operating system that can read/write a FAT32 or FAT16 formatted SD or MMC memory card. FAT16 and FAT32 Filesystem with full long filename support. Supports all currently active ColecoVision cartridge formats, including the MegaCart games and Lord of the Dungeon. Supports automatic load/save of game data for Lord of the Dungeon to SD card. No NVRAM/Battery backup required, saves are not tied to any particular cart. New 512KB Hybrid Bank Switching mode allowing new games/applications full Read/Write access to 512KB of RAM. Programmer API for accessing cartridge services at run time. can all be dynamically loaded from and saved to SD card in microseconds while the game is running. Cartridge system software loaded dynamically from SD card at power on. One button display of Colecovision game screen shots and manuals from menu for game under cursor. Note: it's not possible for a unmodified game program to save/load its high scores from the SD card. A 16k Bank is selected by touching an address in FFxx, depending on the size of the Mega-Cart. The memory map of a game in 512KB Hybrid R/W mode depends on if a 16KB R/O window is selected or if 8k/8k Read/Write windows are selected. If a 16KB read-only window is selected, the scheme is identical to MegaCart mode, except the banking addresses are in the fixed area, not the banked area. If an 8k/8k R/W window is selected, all 512KB of SRAM can be read/written in 64 separate banks. The RAM is write protected in this mode. No actions by the CV will cause RAM to be changed, other than to select a R/W bank (below) and then change memory. In addition to the read/write memory detailed above, the onboard CPU has full access to the SRAM. You can ask the onboard CPU to make changes, fill memory, load and save SRAM pages to/from SD card, etc, all while your program is running. Of course these functions can be easily supplemented later with firmware updates from SD card. The firmware would allow exFAT file support which in theory would support existing size SDXC cards and future 2TB SDXC cards. HDTV1080P on AtariAge says: "Even if the exFAT file system with SDXC support is never added to the Ultimate Colecovision SD cartridge that would be a very small issue. Is any company or individual going to spend several years to make a game or program that takes up to 2TB's of space for the Colecovision or ADAM? I doubt anyone will even need to purchase a 64GB SDXC card for the Colecovision/ADAM. The existing FAT32 file system with 32GB SDHC support in theory will be enough space for all the games and programs that will every be made for the ADAM/Colecovsion system. I would be surprised if anyone comes close to using up all the space on a 32GB size SDHC card." $ 130,- for the Ultimate Cartridge, and + around $ 6 to 8,- for shipping. Including the SD flash card of course. You can always contact Steven here for an order. For more informations: AtariMax Ultimate SD Cartridge. Shipping worldwide will available by Air Mail. AtariMax can take orders by PayPal or Google Checkout. The SD Ultimate Cart works fine in all versions of ColecoVisions. (NTSC, PAL and SECAM). Last updated: September. 15. 2012.